A former farm set on over two acres land situated on the edge of the town of Antrain, 35560. The property comprises of the Main house with a cottage attached, 3 large barns, and additional detached cottage with bread oven ready for renovation. The seller has applied for planning permission which was granted with plans drawn up. The town has a variety of restaurants and bars, supermarket, florist, bakeries, and hairdressers. Along with chemist, doctors. There is also a convenient garage with fuel station, bank, and post office. There are three schools one of which is private and the others are primary and college level. The town of Pontorson is within 11 km, and is within 35 minutes of Dinard and Rennes airports and the ferry port of St Malo 45 minutes away. The famous Mont St Michel just 15 minutes away. The property even thou close to the town, deer has often been seen eating from the array of fruit trees in the orchard. There is a deep well in the court yard, and a small stream at the rear of the property. Early evening the bird display including the swifts and bats are mind blowing. Planning permission for a 4 bedroom house with 3 bathrooms has been granted. A large kitchen, a dining room and a large living room with feature stone fire place. The kitchen with barn style door, new window installed and original wooden floor, door way leading to the dining room with large window, original wooden floor in very good condition, walls back to stone and beams. From the dining room you turn right into a large living room with huge stone fire place and original tile floor with new windows to the front and rear gardens. From the living room you enter into hall way which is big enough to install a toilet/bathroom and entrance with front door leading to the large courtyard garden. Stairs from the living room leads to the first floor. The stairs are original oak which need a bit of TLC but will be stunning when restored. On the first floor it is planned for two large bedrooms and a bathroom. Currently this is just one large room. There are 3 windows and option of a forth in the bathroom if desired. Stairs leading to 2nd Floor. Original oak staircase to the second floor that is planned to have two bedrooms and a bathroom with dormer windows. Current access is through a dwarf door from the main house or the main front door is located in the courtyard. The ground floor is packed earth at present with a stair case leading to the first floor. This house will need full renovation but has full permission for open plan kitchen diner and two bedrooms, plus a bathroom. Seller has had professional drawings designed for a four bedroom gîte looking onto the courtyard and backing on to the orchard. Attached to barn one this huge barn which has plans for a bar/diner with four large family B&B bedrooms with en-suite bathrooms. Again looking on to the courtyard and backing on to the orchard. This fantastic barn has everything going for it and would make an ideal four bed house. There is a large hanger to the rear with large brick tile shed joined to the side and situated behind to the left of the other barns. 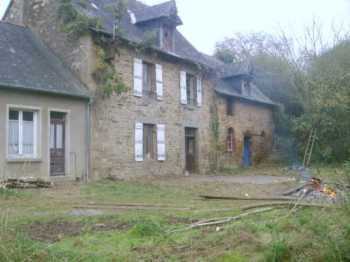 There is also a small two storey cottage with bread oven for complete renovation. Pig sty, Hen houses and a slosh pit. A mobile home is currently on site. Here we have 8000 m2, over 2 acres of constructible land. The property has two entrances. One either side of the two houses. Large courtyard. There is a large orchard that is overgrown at the moment. The property could be connected to Mains drains, which is located a short distance from the house on the road in front of the house. There is a temporary electric supply is in place and water is connected to a tap in the main house which has proved very helpful for renovations.